The Nordenfelt gun was designed by Swedish engineer Helge Palmcrantz as a multiple barrel machine gun. The machine gun had a maximum of twelve barrels and was manufactured for calibres up to 25 mm. The mechanism which loaded and fired the gun was patented in 1873 and consisted of a lever moved backwards and forwards. The gun was named after Thorsten Nordenfelt, a Swedish steel producer working in London at the time who funded the production. 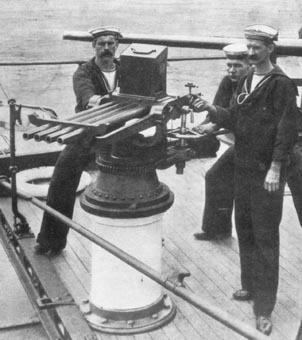 The gun was produced in England and was adopted by the British Royal Navy. During a demonstration, 3,000 rounds were fired in 3 minutes and 3 seconds using a 10 barreled version. Outclassed by the Maxim gun, the Nordenfelt gun was phased out. In 1888 Nordenfelt merged with the Maxim Gun Company and became Maxim Nordenfelt Guns and Ammunitions Company Limited. They have been made 45 queries to database.